If you are wondering which place to visit this summer, here's some fodder for thought. Ever tried Toronto? There are few cities with a landscape as picturesque as Toronto. 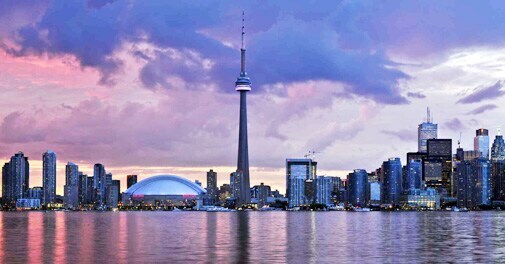 A city in the state of Ontario, Canada, Toronto is well known as the country's cultural, entertainment and financial capital. While the Niagara Falls is just a short drive away, the city plays host to tourist attractions such as The Eaton Centre, the high-as-crazy CN Tower, The Royal Ontario Museum (with its fine collection of artefacts) and the relaxing Centre Island. Want more? Tourism Toronto has planned an array of events to ensure that a tourist on its shores never faces even one dull moment. Here's a list of festivals - encompassing everything from music and movies to food - that should not be missed if you are to drop by Canada anytime over the next three months. This festival is the international multi-arts event for people open to having art change their outlook of the world. For ten days each June, the Luminato Festival transforms theatres, parks and public spaces across the city into jamming spots for artists - established as well as upcoming to come play, share and create. Like they say: "When the unexpected meets the transformative, that's a Luminato moment." North by Northeast is all about rocking the city with 10 days of great music and the coolest music-related films from places across the world. You'll hear original music you've never heard before and get a first look at hand-picked cinematic works based on music. Known for presenting the best in Canadian and International talent concerts, the Mississauga Waterfront Festival offers everything from stilt walkers and fire-eaters to exciting water shows, family carnivals, interactive sports activities and delicious food-related events. Also, make the most of outdoor concerts, theatre performances and a petting zoo. This event delivers the sounds of the world's greatest jazz musicians, from the quaint and most intimate of venues to large concert halls. Attractions include more than 350 performances with over 1,500 musicians performing at approximately 40 locations around Toronto. Be sure to schedule this smooth festival into your summer calendar. WorldPride 2014 Toronto, presented by Pride Toronto, is shaping up to be one of the biggest international events of our times. These 10 days of queer celebration will turn streets into parades, parks into parties and strangers into friends. Come out to find locals as well as tourists from far-off lands gathering in neighbourhoods right across the city. Befriend the colours, broaden the mind. 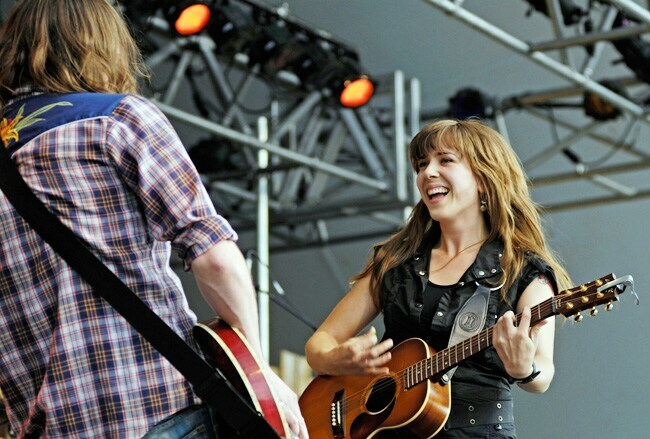 Canada's Walk of Fame Festival - where talent meets ear. The Fringe Festival features more than 155 indie shows in over 25 venues, in every genre - with local, national, and international artistes. There are new plays and old favourites, experimental works and fresh hits. Dance lovers can check out dance productions, and families can look forward to shows for even the littlest Fringer. The outdoor Fringe Club features buskers, bands, visual artists, tent talks, and plays in tents and sheds - all free! As the largest of its kind in Canada, the Toronto Outdoor Art Exhibition offers a fresh-air and free alternative to conventional art shows and galleries. Approximately 500 artistes participate and over 100,000 visitors attend the exhibition every year. Side by side, established artists, undiscovered talents and innovative students sell their work directly to the public and make lasting connections with art dealers and collectors. Discover the finest dishes in the city at one of Toronto's favourite culinary celebrations. Enjoy delicious three-course prix fixe menus at close to 200 of the city's top restaurants at fantastic price points. Lunch and dinner prix fixe menus, including starter, entrÃ©e and dessert, range from $15 to $45. 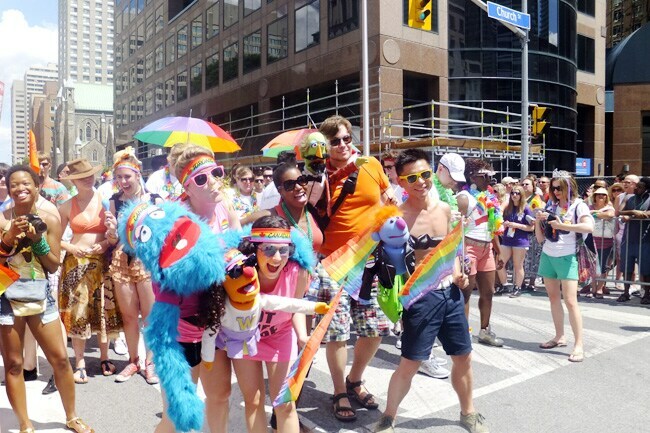 Cheerful participants pose with furry muppets to make a poignant statement at the WorldPride 2012 Toronto. Join in on this free family street party as midtown Toronto's Hillcrest Village, between Winona Drive & Christie Street, turns into a showcase of pulsating music, passionate dancing, fiery foods, a Latin market, a children's area and much more. Don't miss the free open-air Zumba class that will kick off the event at the main stage each day. Zumba, a Latin dance form and rhythms fitness workout, helps participants maintain their physique while having fun at the same time. An exciting cultural explosion of Caribbean music, cuisine, revelry as well as visual and performing arts. Over nearly fifty years, it has become a major international event and the largest cultural festival of its kind in North America. Toronto comes alive as the city explodes with the pulsating rhythms and melodies of Calypso, Soca, Reggae, Hip Hop, Chutney, Steel Pan and Brass Bands. The Canadian National Exhibition (CNE) is fun for the entire family. Midway rides bring chills and thrills. Horse shows and dog shows entertain both young and old. The expo culminates in a thrilling air show that fills the sky with a range of exciting planes and choppers, including the iconic Snowbird. A terrific way to cap the summer. Non-stop, action-packed, fun-filled entertainment comes out in full strength as comedians, contortionists, musicians, magicians, fire jugglers, acrobats, aerial artists, clowns and daredevils band together for North America's biggest street performer festival on the world's most vibrant street! Admission is by donation in support of Epilepsy Toronto. Prepare to be amazed! Not enough? You could also try the Toronto International Film Festival, to be held from September 4 to 14, or Canada's Walk of Fame Festival, a music fest that will make you grow beyond your ears, through the whole of the month. Now, rethink that ticket to the Alps, because Canada's where everything's happening this summer!